Britton JC, Morton B, 1979. Corbicula in North America: the evidence reviewed and evaluated. In: Britton JC, ed, Proceedings of the First International Corbicula Symposium, Texas Christian University Research Foundation, Fort Worth, Texas, USA, 249-287. Aguirre, W. and S. G. Poss, 1999. Non-Indigenous Species In the Gulf of Mexico Ecosystem: Corbicula fluminea (Muller, 1774) . Gulf States Marine Fisheries Commission (GSMFC). Corbicula fluminea is a freshwater species native to southeastern China, Korea and southeastern Russia, Ussuri Basin, Africa and Australia (Aguirre & Poss, 1999). juveniles are released, they have small dimensions (around 250 μm) but completely formed with a well developed shell, adductor muscles, foot, statocysts, gills and digestive system and have the usual D-shaped configuration. byssal thread. These juveniles can also be re-suspended by turbulent flows and dispersed for long distances, principally in the downstream direction. Balcom, N. C. 1994. Aquatic Immigrants of the Northeast, No. 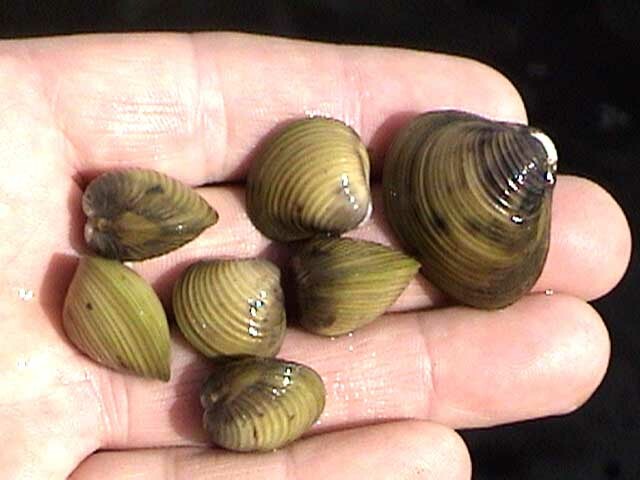 4: Asian Clam, Corbicula fluminea. Connecticut Sea Grant College Program. Ciutti F, Cappelletti C, 2009. First record of Corbicula fluminalis (Müller, 1774) in Lake Garda (Italy), living in sympatry with Corbicula fluminea (Müller, 1774). Journal of Limnology, 68(1):162-165. The majority of studies concluded that this species reproduces twice a year: one occasion in the spring going through the summer and the other starting in late summer and going through the autumn. Reproduction Corbicula fluminea is a hermaphrodite (both sexes are found on one organism) and is capable of self-fertilisation. Sperm is released into the water, caught by another clam, and brooded in the gills. The larvae are released through the excurrent siphon and sent out into the water column. Spawning can continue year around in water temperatures higher than 16 degrees Celsius. The water temperature must be above 16 degrees Celsius for the clams to release their larvae (Aguirre & Poss, 1999). The fertilization occurs inside the paleal cavity and larvae are incubated in branchial water tubes. They feed primarily on phytoplankton, which they filter from the sandy or muddy bottom of streams, lakes, or canals. Prezant RS, Chalermwat K, 1984. Flotation of the bivalve Corbicula fluminea as a means of dispersal. Science, 225(4669):1491-1493. (Strayer 1999); Corbicula may advantageously compete for food resources with sphaeriids and juvenile unionids since they have larger filtration rates, on a per biomass basis, than sphaeriids and unionids and consequently have the potential to limit planktonic food available to native bivalves (McMahon 1991). Karatayev AY, Padilla DK, Minchin D, Boltovskoy D, Burlakova LE, 2007. Changes in global economies and trade: the potential spread of exotic freshwater bivalves. Biological Invasions, 9(2):161-180.